The rise of political Islam, as a force in world politics, has prompted questions and theories concerning its nature and compatibility with democratic values. Not least have been discussions and conflicts within Islamic communities, particularly in Europe where choices of identity and allegiance are growing acute. Bassam Tibi provides a broad ranging assessment of political Islam in the world, in all its various manifestations. In particular he focuses on Europe which is also home to a significant Islamic minority. 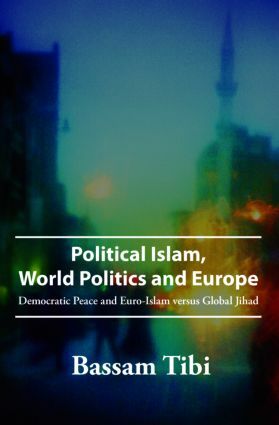 Whilst rejecting the Clash of Civilizations theory the author clearly demonstrates the growing conflict and incompatibility between Islamist movements and European democracy. A practicing Muslim himself, Bassam Tibi, makes clear the vital importance of developing a Euro Islam that will peacefully accommodate religious beliefs within an inclusive democratic European culture. The Shi’ite option: Internationalism for an export of the Islamic revolution of Iran. A failed effort! The European diaspora of Muslim migrants and the idea of Europe: Could they become Europeans by choice?